I first attempted to desensitise hay fever patients by placing drops of pollen extract under the tongue In 1976, and communicated the results to the European Allergy Congress in Helsinki. This was a pilot trial, and results were patchy, but encouraging because some of the most severe cases were much improved. In 1982 I was consulted just after the pollen season by a young man with severe hay fever. To confirm the diagnosis I flicked some dry pollen up his nose using a microspoon, an instrument I had invented to deliver a measured dose of dry pollen to the nose. The purpose of this test was to prove objectively that patients were really sensitive to pollen, or that they had been successfully desensitised . To my surprise nothing happened, and a repeat test a week later was also negative. This observation suggested that he could have become immune by natural exposure to pollen during the season which had just passed, and that if he were given pollen extract every day under the tongue throughout the winter this immunity might be preserved or even enhanced before the next season. He received sublingual pollen extract all that winter, and had very little hay fever next year. Ethical committee permission was obtained for a double blind placebo controlled trial under the aegis of the Midland Asthma and Allergy Research Association. The results were published as a poster at the 13th International Allergy Congress in 1988, and on three occasions since then at the British Society for Allergy annual meetings, without attracting any interest. 23 volunteers came forward in 1984. Almost all were already well known because they had taken part in many trials and were accustomed to keeping good records of symptoms and medication. In spring 1984 they all had skin test titrations using tenfold dilutions of a pollen extract of the five commonest grasses, ranging from 50,000 to 5 weight/volume ‘Noon’ units, using Morrow Brown Standardised Prick Test Needles. They also has their nasal sensitivity to grass pollen assessed as described below. 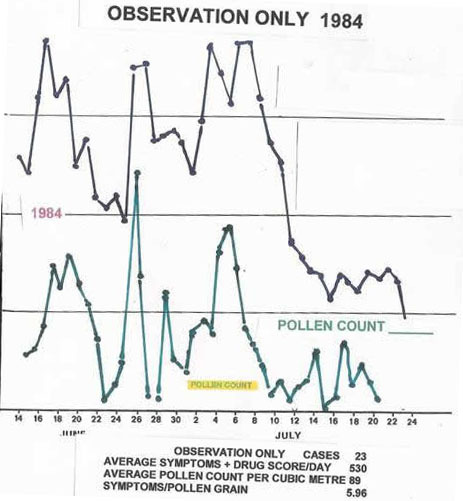 All 23 volunteers kept satisfactory records of symptom scores and medication in the pollen season of 1984. They returned in the autumn, skin test titration and nasal provocation tests were repeated, and they were issued with coded dropper bottles of SLIT or placebo and shown how to take it under the tongue. 13 received active SLIT, and 10 placebo. They were seen again in a month, and again pre-seasonally and as soon as possible post-seasonally. The results in 1985 were not statistically significant, although several cases were very much improved. It was decided to give all 23 volunteers active material every day, even in season, throughout the following years of 1986 and 1987 in order to find out if they would improve further with long-term treatment. 33 new volunteers came forward in the spring of 1985. They were tested as described above, kept records in the season of 1985, and were issued with coded SLIT or Placebo in September. It was decided to limit the placebo group to 12 only, and to give 21 active SLIT. After 1985 all 33 volunteers received active material as a reward for their cooperation. A mixture of equal quantities of Cocksfoot, Rye, Meadow, Timothy, and Yorkshire Fog pollens was supplied by Dome laboratories. A 10% weight/volume extract was made in buffered saline, centrifuged, and filtered through a Millipore filter with a pore size of 0.22 um, an equal volume of glycerol added to make a final concentration of 5%, and dispensed in dropper bottles which delivered 0.05 ml/drop. The strength was defined in Noon units, so that the 5% weight volume extract was rated at 50,000 NU/ml, each batch was standardised by RAST inhibition, and that one drop would deliver 2500 units. These extracts were used to make all dilutions for skin tests and nasal tests,. Placebos also contained glycerol, were suitably tinted, and tasted identical. All bottles were secretly coded by the laboratory. All volunteers were given one drop of a 1% extract which was retained under the tongue for 5 minutes and spat out. The very few who had a slight reaction to this were given a bottle of 1% extract with instructions to take one extra drop per day according to reaction, working up to 5 drops. When seen a week later they were given a drop of the 5% extract, but there were no reactions. Coded bottles were then issued with instructions to take one drop under the tongue every day thereafter, retain for five minutes, and spit out. They were shown how to place the drop behind the teeth under the tongue, avoiding the lips which would react. They were warned not to take any drops if there was a dental or gum problem. The starting dose was one drop a day from the end of the 1984 season right through the pollen season of 1985, when one drop continued through the season. On review in the autumn of 1985 there had been no reactions to the drops, but the results had been disappointing. Because some triallists had increased the dose on their own initiative without any problems, it was decided to increase the dose according to tolerance for the 23 volunteers who had joined the trial in 1984, and for the 33 who joined in 1985. The result was that by the spring of 1986 most patients were taking 6-8 drops per day, and some even 10 drops. Paradoxically these patients were found to have become more sensitive as shown by the nasal provocation tests, but reducing the dose to one drop a day resulted in greatly increased nasal tolerance within a month. Sometimes the nasal tests were negative at a level of 4000 units, a strength which would produce a large skin test reaction. The optimum dosage was not defined, but remained at one drop a day all year including pollen season. No serious side-effects were encountered except occasional itching or swelling of the lips if the dropper touched the lip, or the drop was deposited in front of the teeth. SLIT had to be stopped if there were gum problems or dental surgery. At the first reassessment it was found that some volunteers had misunderstood the dosage instructions and were taking much more, even a whole dropper full in one or two instances, without any side-effects. The instructions were then changed to swallow instead of spit, as most people were already doing. On the whole the side-effects were so slight that very few guessed if they were having placebo or not. 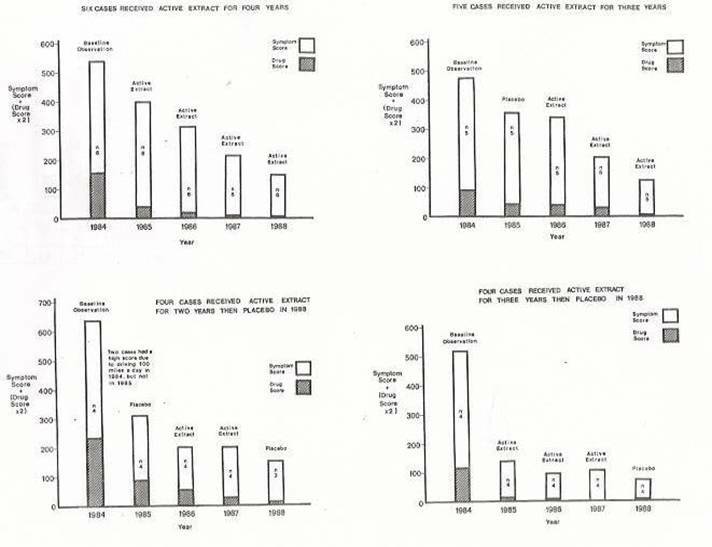 23 volunteers kept satisfactory Symptoms and Treatment charts in 1984 to provide a baseline for comparison with future years. When assessed after the season of 1985, 10 had received Placebo and 13 Active SLIT. It was decied that those who had received Active SLIT should continue to have open Active SLIT for the following years, and those who had had placebo would now have Active SLIT, as a reward for their excellent cooperation. The Total Symptoms and Drug scores for the group for each separate day provided the data for this chart, alongside the daily pollen count which provided a very variable challenge for subjects who also varied greatly in their degree of sensitivity. 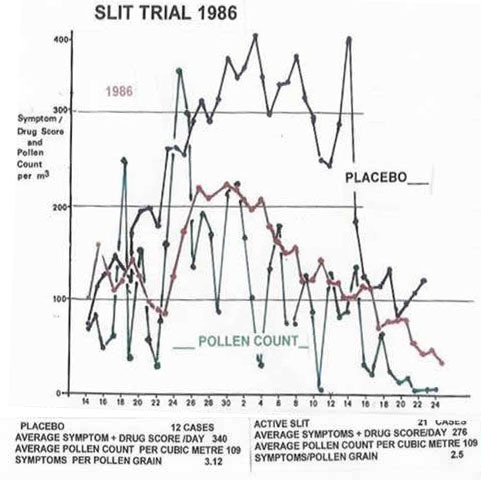 This graph compares the total daily symptoms and drug scores for the Placebo and Active group in 1985 with the daily pollen count for 1985. Another group of volunteers had been recruited in 1985 and kept Symptoms and Treatment charts to provide a baseline for future comparison. 21 of them kept satisfactory records, and their data has been added to the data from the 10 who were receiving Placebo. It is clear that the 13 who were receiving Active SLIT were considerably less responsive to the fluctuating pollen counts than the 31 who were receiving no specific treatment. Only one subject took no suppressive drugs in 1984, but in 1985 6 of the 13 who received Active SLIT no longer needed drugs, while none of the 10 on placebo could do without them. A fresh batch of volunteers were seen in the spring of 1985 and issued with Symptoms and Treatment charts for June & July, in order to establish a base-line for 1985. 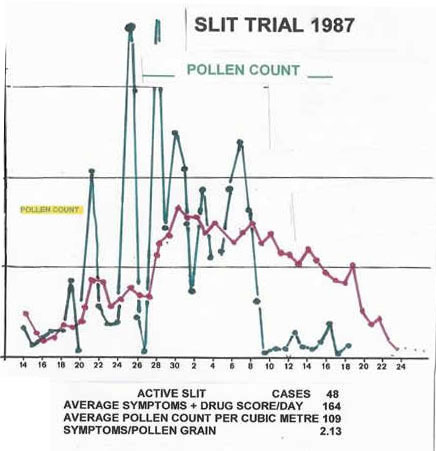 They were reviewed soon after the pollen season of 1985, and the 33 who had kept satisfactory records were issued with coded SLIT in preparation for the Pollen season of 1986. When reviewed after the season of 1986 they were all given op[en Active SLIT for following years as a reward for their help in assessing SLIT. The progressive improvement in scores in cases those who had had Active SLIT for two successive years is notable, but the most remarkable outcome was that 21 out of 30 no longer required any medication in 1987. In 1987 all volunteers received open Active SLIT. Seven had dropped out for various reasons, such as moving to another part of the country, changing jobs, or did not feel it was worth the bother, but none dropped out because they could not tolerate the drops on account of side-effects. 48 volunteers continued into 1987. The symptoms per pollen grain dropped to 1.84 in 20 cases from Group II. 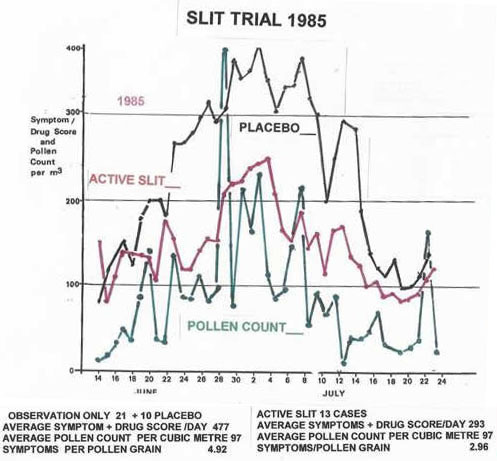 In 10 and 9 cases from Group I who had continued in the trial since 1984 the symptoms / grain was 2.21 and 2.34 respectively, and the average for the 48 cases was 2.13. By far the most striking and important feature of the results in 1987 was that 16 of the 20 cases from Group II and 13 out of 18 in Group I, no longer required medication by 1987. Pollen specific IgG1and IgG4 were measured in all sera by ELISA using monoclonal antibodies. Very high titres of IgG1, and to a lesser extent IgG4, were found in 7 cases before starting SLIT, increasing further as SLIT was continued. This was probably because 5 of them had had pollen injections in the past, but did not explain high titres in 5 others who had never had injections. Immunological results bore no relationship to clinical results, and the only evidence of the appearance of blocking antibodies was obtained by the “patient/self” test. Because conventional immunological investigations were unhelpful it was decided to use the “patient/self” test to demonstrate blocking antibodies. This test was invented by the Kate Maunsell over fifty years ago, and only used once since. It is performed by mixing equal amounts of two fold dilutions of pollen extract with serum obtained before or with serum obtained after SLIT. This mixture is then injected intradermally into the same patient, so there is no risk of infection. If there are sufficient ‘blocking’ antibodies in the serum to combine with all the pollen present in the dilution of extract being used, there will be no pollen left over to cause a skin reaction. As the strength of the pollen extract mixed with the serum increases there will be a point where there will be insufficient antibody to neutralise all the pollen, and a reaction will occur. The nature of the antibody which combines with the pollen allergen is unknown. This example of a P/S test is from a telephone linesman who spent much time up poles exposed to all the pollen in the countryside. He derived great benefit from SLIT which has persisted from 1985 to 2004. The top row of tests using 1984 serum before treatment with SLIT shows a negative control on left, and +ves from the lowest concentration of 0.05 Pharmacia units up to 12.5, 8 dilution steps. The next row used serum obtained after SLIT in 1985, after SLIT 1986, and after SLIT 1987, showing inhibition up to 12.5 units. The P/S test was carried out on volunteers who had had several years SLIT and all showed similar responses. The results of an analysis of the results with particular attention to the duration of treatment have produced remarkable graphic evidence, as shown above, confirming that is SLIT is persisted with for as long as possible the benefits become more and more apparent, particularly on the need for medication. Continuation of SLIT until 1990 has shown similar results, but the numbers lost to follow-up were high. Anecdotally, occasional accidental meetings with individuals who had taken part in these trials have shown that the benefits of the treatment are long-lasting. 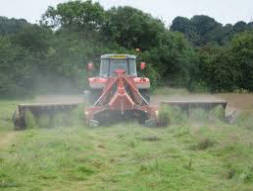 Some have not had any Hay Fever for as long as 20 years or more, suggesting that SLIT can actually cure hay fever. These encouraging results might stimulate further interest in SLIT, not only for Hay Fever, but also SLIT using other potent allergens, and even foods. This unpublished work is presented as a poster for the third time in the hope of arousing some interest in the UK in a risk-free method of immunotherapy which can be very effective. Since 1986, suppressive drugs are the only treatment available for hay fever. Although good news for the drug industry, the increasing numbers of British hay fever sufferers are deprived as compared with the rest of the world. The great interest in SLIT in Europe, and the many successful trials there since 1988 using different allergens, support the encouraging findings of this trial, and of the potential importance of the sublingual route for 'desensitisation' to allergens. To inject allergens must be an unnatural thing to do, so disastrous reactions could be expected. The sublingual area is not only well-known for absorbing medication, but is the first area to encounter foreign proteins when the infant is given foods for the first time. This area must be a major portal to stimulate to the immune system to adapt to foreign proteins. It follows that this may be the natural route to induce immunological tolerance to allergens. The most important findings in this study are that persistent daily sublingual immuno-stimulation for several years leads to progressive improvement, and that the need for pharmacotherapy is progressively reduced year by year. The patient/self test provides clear evidence that tolerance is being acquired, and perhaps a clue to how the acquisition of immune tolerance is acquired by the sub-lingual route.